​The first thing you’ll notice is the massive tree right out the front. Apart from being incredibly close to the home it also blocked out sunlight which could have potentially caused mold issues down the track. The first tip is to remove overgrown trees which look untidy, out of control or could potentially cause an issue down the track. Tip: Some trees especially natives may require council approval before removing. If in doubt contact your local council for further information and always use an insured professional in the event something goes wrong especially if the trees are close to the home. 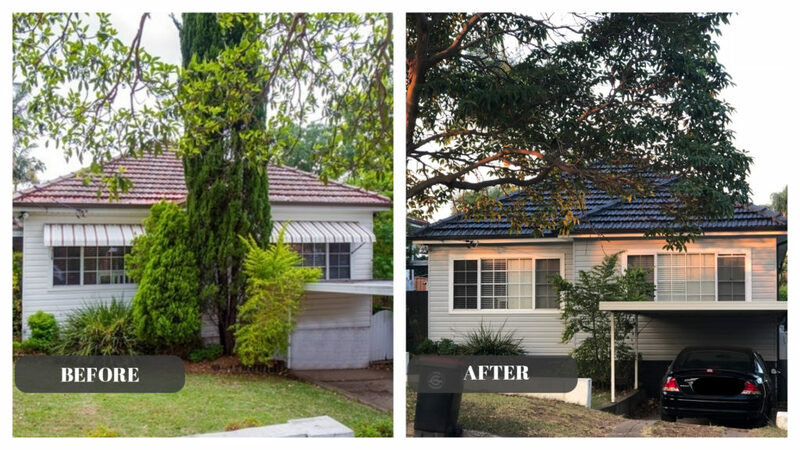 A splash of paint can fix everything and in this case modernise an underwhelming weatherboard. I used an on-trend colour palette to take years off this homes appearance. Removing the dated shades also helped! There are loads of grey homes now and to avoid looking too similar; I chose a popular colour and doubled its intensity to ensure it it was a unique shade. This colour palette includes Dulux Tranquil Retreat (double strength), Lexicon Quarter around the windows and Colorbond Monument on the gutters and brickwork for a hit of contrast. Tip: Visit your local hardware store and pick up a few sample pots and get painting on some plywood to see what the colours look like together. Paint brands now also offer a visual colour selection tools where you can upload a photo of the interior or exterior of your home and see what the colour will look like in your space. Orange may be the new black but it’s not the case when it comes to your roof! Black and grey tiles are the most popular choices and this home had orange terracotta tiles which were damaged, moldy and really showed this home’s age. Before buying I did a building report and knew there were a few tile issues which needed to be addressed. I enlisted a professional roof restorer who changed the broken tiles, pressure cleaned the roof and then sprayed it, giving this house its refreshed appearance. The roof has been sprayed using Dulux Colorbond Monument, the same shade as the painted brickwork. Tip: Be sure that if you’re painting your roof that it’s properly primed and sealed to ensure the longevity of the paint. Completed a transformation of your own? Share it with me on Facebook by tagging Love Home Loans in the post or share to our page.